One of my ongoing quilting bees is do. Good Stitches, which is a charity bee. Each month, a different member of the group asks the other members to make a specific block or style of block from their scraps or fabric stash. Then, the requester collects all the blocks, puts them together, and sends it off to a charitable organization. 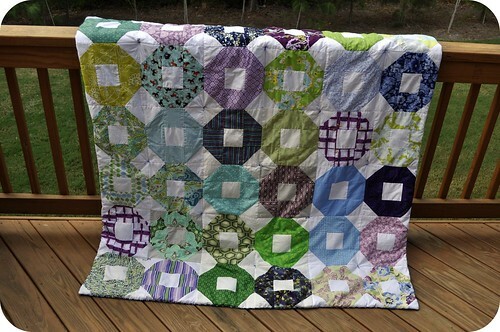 Back in April, I asked the other members of my group to make a shoo-fly block from Malka Dubrawsky's great free block tutorial in shades of green and blue. My group members made a whole bunch of amazing blocks and sent them to me to assemble into a quilt. I have to thank my very patient group members, because all of this happened right around the time of my move. I wasn't able to get the quilt assembled in as timely a manner as I had hoped, but it was my first order of business after getting my sewing space set up in the new house. 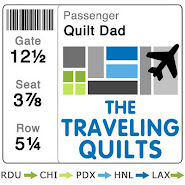 And since the quilt came together in a way that, to me, made it perfect for a young boy, I finished it in the way I like to make baby quilts: by using an ultra high-loft batting, sewing it together right sides together and flipping it out, and tying it instead of quilting it. The result is a super soft, almost duvet-like quilt that's great as a floor mat for baby as well as for snuggling as the child gets older. So, 5 months after requesting the blocks from my group members -- again, thanks for your patience, y'all! 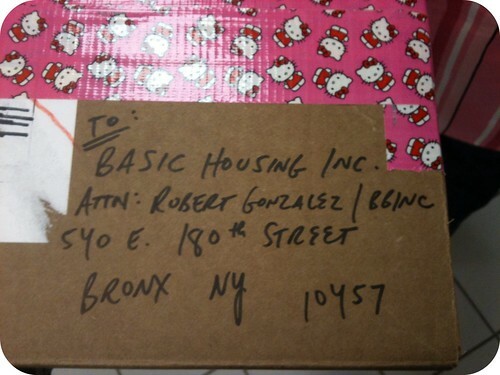 -- I finally got it all packaged up and sent this week. 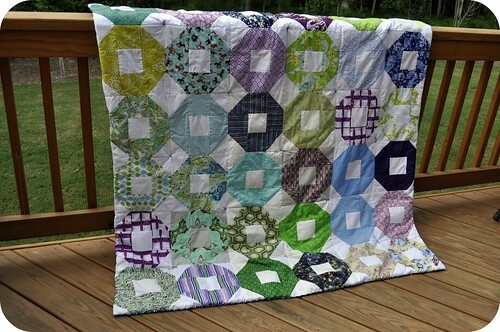 I decided to send the quilt to a very worthy cause: my friend Victoria's Bumble Beans Basics Quilt Gather. 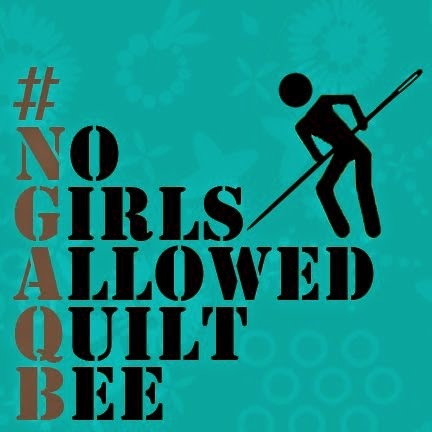 If you have any quilts that you're willing to donate to needy families in the NYC area, please visit Victoria's site and learn more about the quilt gather. Fabulous quilt, John! I love the way you finished it, too - it will be treasured, I'm sure!! 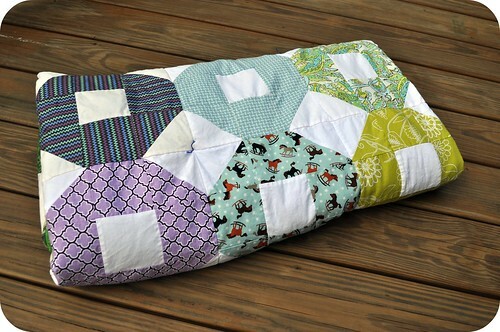 I just finished a quilt in the same way for a little boy. It just works perfectly! It looks great! I think the light quilting was a fun choice, and I'm glad all of our blocks work so well together. They were fun to make! I liked that you tied the quilt. What brand of batting did you use? 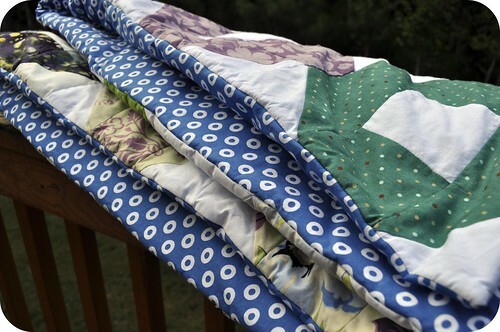 HI, JUST FOUND YOUR BLOG BY HITTING QUILT BLOGS IN THE SEARCH ENGINE..... We make quilts this way all the time for charity.... great fast way to make them too. And depending on the weight of the batt. it can be light weight or nice and warm. the blocks turned out so nice... it could be used as a signiture type quilt too. Good job!